Forgot password of PDF file? Don’t worry, we have something for you. PDF password remover tools are those software programs that can be used to bypass the password restriction of a PDF file. 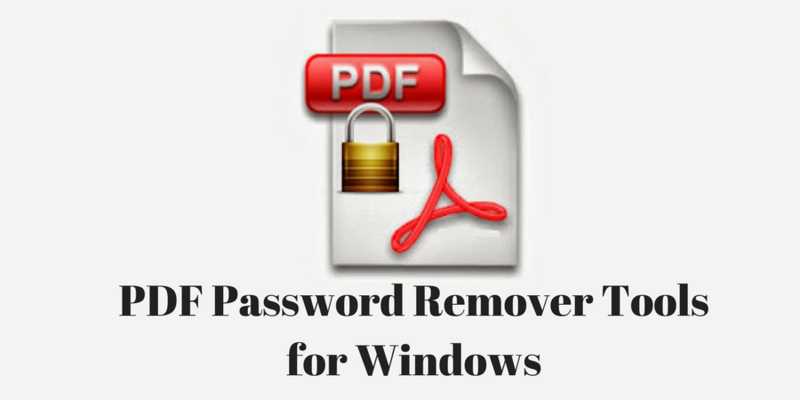 If you are not able to open a PDF file just because it is asking password, you can use these password remover tools. PDF password cracker or PDF password recovery tools can be used to find or remove the password of a PDF file and get access to it. Majority of PDF password crackers are paid, but there are few good but paid. In this post, we are listing 5 free password remover tools for Windows. But never use these password cracking tools for illegally accessing a PDF file. PDFCrack is one of the best PDF passwords cracking tools for Windows system. It can recover both owner password and user password from an encrypted PDF file. PDFCrack recovers both user password and owner passwords from encrypted PDFs. It only works with PDF files up to version 1.6 with 128-bit RC4 encryption. It uses the brute forcing attack with a pre-defined wordlist to crack the password. The only drawback of the tool is that it can take longer time for complicated passwords. PDFCrack is a command-line tool and supports all available version of Windows. FreeMyPDF.com is an online tool for removing password of PDF files. It also removes PDF restrictions that prevent you from copying or printing text. This tool can remove passwords, but it cannot recover. It will only decrypt PDF files up to version 1.7 level 8 with 128-bit AES encryption. It also has maximum PDF file size of 400 MB. You do not need to install anything and it also works really fast. If you have small PDF files to crack, you should try once. qpdf is also a command-line PDF password remover tool. It does not find the password but removes. It works with PDF files up to version 2.0 with 256-bit AES encryption, It is easy to use tool and should work on both 32-bit and 64-bit versions of Windows 10, Windows 8, Windows 7, Windows Vista, and Windows XP. The source code of the tool is also available on Github and Sourceforge. If you are a developer, you can try understanding how it works or can contribute to development. PDF Password Remover is another nice, simple to use PDF password remover tool. This tool is designed for removing owner password from any kind of Pdf file. It also removes PDF restrictions. It works with PDF files up to version 1.7 level 8 with 128-bit RC4 encryption. It is really easy to use but it does not support some of the higher encryption levels. If PDF has user password, this tool is not going to help you. It supports all available Windows OS including 64-bit Windows 10. PDF Unlocker is another Windows tool for unlocking PDF file. The tool is portable so you can carry it with you. It can remove passwords from PDF files and recover owner password from encrypted PDF. For breaking PDF password, this tool uses brute-force to crack the password. It can recover the 5-digit owner password on a version 1.7 level 8 PDF with 128-bit AES encryption in about an hour. If the password is longer, it may take days or weeks to crack the password. This tool requires Java to run. This tool should work on Windows 10, Windows 8, Windows 7, Windows Vista, and Windows XP. These are few PDF password cracker available for free. You can download and use any of these tools to crack the password of PDF files and bypass restrictions. Few of these tools can recover password but few can just remove to give access. If depends on you what tool you really need. I hope this article helps. We have several other useful articles on several topics. Do not forget to explore more. Also, share your favorite PDF password cracking tool with us via comments.